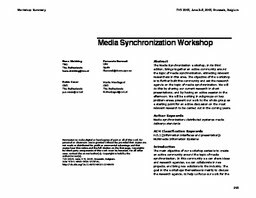 The Media Synchronization workshop, in its third edition, brings together an active community around the topic of media synchronization, attracting relevant researchers in this area. The objective of the workshop is to further built this community and set the research agenda on the topic of media synchronization. We will do this by sharing our current research in short presentations, and by having an active session in the afternoon. We will be working in subgroups on key problem areas, present our work to the whole group as a starting point for an active discussion on the most relevant research to be carried out in the coming years.